Give & Take is a group show centered around the theme of international travel. It will feature the work of students Elliot Smith, Taylor Thomas, Sarah Shotola, Leigh Vandemark, Kate Lowe, Miranda Harris, JP Talty, Sara Gottfried, Gabriela Fulginiti, Renata Fulginiti and others. 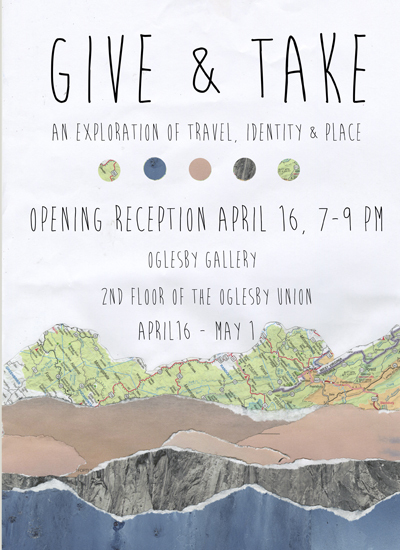 The opening will be on Saturday, April 16th from 7 – 9 pm at the Oglesby Union Gallery. Refreshments provided.